On Thursday, December 25, 2014, His Grace Bishop Theodosius of Seattle, Vicar of the Western American Diocese of the Russian Orthodox Church Outside of Russia, tonsured Peter Karakozov, for many years the personal assistant to His Eminence Archbishop Kyrill, Ruling Bishop of the diocese. He was given the name Peter after Holy New Martyr Peter, Metropolitan of Krutitsa. Monk Peter joins the Brotherhood of St Ignatius (Bryanchaninov) in San Francisco. Monk Peter will be elevated to the rank of Hierdeacon on the Feast of the Nativity of Christ, December 25, 2014 / January 7, 2105. Saint Herman's West Youth Conference publishes the schedule for its VIII confernce held in at Saint George Russian Orthodox Church in Salt Lake City, Utah, from December 22nd to 26th, 2014. Participants are requested to register by Monday December 8th. On November 11/24, 2014, our Ruling Bishop His Eminence Archbishop Kyrill marked his 60th Birthday. Heartfelt congratulations are offered from the Diocesan Council, clergy and all the faithful of the Western American Diocese with this Jubilee with wishes of health and length of days in service to our Diocese. On Thursday October 2, 2014, in Monterey, CA, a banquet was held for the clergy and their spouses marking the 80th Anniversary of the Western American Diocese. The event was held in conjunction with the annual fall pastoral retreat and the celebration of the 700th Anniversary of the birth of St. Sergius of Radonezh and the 50th Anniversary of the Canonization of St. John of Kronstadt by the Russian Orthodox Church Outside of Russia held at Saint Seraphim of Sarov Church in Seaside, CA. Love a righteous man, and he will love thee. Dear in the Lord fathers and concelebrants, brothers, sisters, and children – good and faithful servants of the Western American Diocese! This year, 2014, our Russian Orthodox Church is celebrating two anniversaries: 700 years since the birth of St. Sergius of Radonezh, and 50 years since the glorification of the holy and righteous John of Kronstadt by the Russian Orthodox Church Outside Russia. The 23rd Russian Orthodox Church Musicians’ Conference to be held from October 8 – 12, 2014, is announcing special rates and scheduled activities. Thanks to a grant from the Russian American Women’s League, special rates for hotel registration, including $525.00 for double occupancy, extended through September 7! Calistoga Orthodox Wines was founded by Priest Akim Provotakis, Rector of Saint Simeon of Verhostursk Church of the Western American Diocese in Calistoga, CA. Calistoga Orthodox Wines has produced a high quality Kagor for use as a chalice wine during the Divine Liturgy. The first vintage was so successful that it is completely sold out. Now, a new one is in production for release in the near future. His Eminence Archbishop Kyrill has announced an All-Diocesan Celebration-Pilgrimage to Saint Seraphim of Sarov Church in Monterey, California, on Saturday the 4th of October, 2014. The “Kursk-Root” Icon of the Most Holy Theotokos, the Directress of the Russian Orthodox Church Outside of Russia, visited the Western American Diocese. She arrived at the end of June, 2014, in time for the opening of the Council of Bishops and the 20th Anniversary of the Canonization of Saint John of Shanghai and San Francisco the Wonderworker celebrated on June 29 of this year. With the blessing of Archbishop Kirill, the Bay Area’s first International Russian Choral Music Festival comes to San Francisco and Berkeley August 3-10, 2014. Four concerts offer a panorama of the exquisite Russian choral music tradition, including rare and new music that has almost never been performed outside Russia. The music ranges from ancient monastic chants to new works, including little-known music from folk and religious traditions, operatic arias and choral arrangements for a Festival Chorus of nearly 100 voices. The "Kursk-Root" Icon of the Most Holy Theotokos arrived in the Western American Diocese for the Council of Bishops of the Russian Orthodox Church Outside of Russia, which convened from the 23 to the 30 of June this year. On June 16/29, during the celebrations surrounding the 20th anniversary of the glorification of St. John of San Francisco, a new bishop for the Russian Orthodox Church Outside of Russia will be consecrated. We offer our readers some information on the episcopal candidate, Archimandrite Nicholas, Bishop-elect of Manhattan and the rite of episcopal consecration as well. The Youth Committee of the Western American Diocese has long desired to organize a work project for our youth, to givet them a 'hand's on' opportunity to contribute to the building up of the Church in our Diocese. The paving of a courtyard and pathway was accomplished by our youth at St. Martin Church in Corvallis, OR, from June 16 to 20, with time for recreation on the last day. A Youth Project sponsored by the Youth Department of the Western American Diocese at Saint Martin Orthodox Church in Corvallis, Oregon, is being held from Tuesday June 17 to Thursday June 19, 2014. The event includes paver installation, painting and landscaping, together with social time and an all-day outing to the Oregon Coast. There is no charge for participation in this event. All expenses (excepting travel to and from Corvallis) will be covered by the parish and/or the WAD Youth Department. The annual diocesan pilgrimage to Fort Ross, located 11 miles north of Jenner, CA, will take place on Memorial Day, May 26, 2014. The Greeting of the Bishop is scheduled for 9:30 am. After Divine Liturgy there will be a procession to the cemetery and a Litya for the Dead. The Sts. Cyril & Athanasius Institute for Orthodox Studies is delighted to announce that registration is OPEN NOW for a Pilgrimage to the Orthodox Sites of the United Kingdom, from 2nd-11th September 2014. An extraordinary journey encompassing the ancient as well as modern-day Orthodox life of Britain: there are only 15 places available on the Institute's first ever-pilgrimage. Reservations for the solemn banquet held on Sunday June 29th at 3:00 pm commemorating the 20th Anniversary of the Canonization of Saint John of Shanghai and San Francisco the Wonderworker are now available online through the website of the Holy Virgin Cathedral "Joy of All Who Sorrow." The 23rd Russian Orthodox Church Musician’s Conference will be hosted by Saints Peter and Paul Church in beautiful Santa Rosa, CA, from October 8th to 12th, 2014. This year the clergy and faithful of the Western American Diocese of the Russian Orthodox Church Outside of Russia will solemnly celebrate the 20th Anniversary of the Canonization of our Father among the Saints John Archbishop of Shanghai and San Francisco the Wonderworker on the 27th, 28th, and 29th of June. Members of the diocese are undertaking several actions in preparation for this great event. On Sunday, May 4th, the Great Consecration took place of the new temple of the parish of St. George in Salt Lake City, Utah. The consecration was presided by His Eminence, Archbishop Kyrill of San Francisco. A 5th year seminarian of Holy Trinity Seminary in Jordanville, NY, Nicholas Kotar of San Francisco (Russian Orthodox Church Outside of Russia), has written a new epic fantasy based on Russian fairy tales and myths entitled "Raven Son". For more information please see the novel's website. During the Second Week of Great Lent the clergy of the Western American Diocese gathered together for a retreat of prayer, lectures and spiritual fellowship from Monday the 10th to Wednesday the 12th of this year. The clergy observed the full cycle of Lenten Divine Services, including the prayers of St. Ephraim the Syrian, as the fathers took turns both reading and chanting on kliros, and conducting the the Divine Services from the Ambo. The Lenten pastoral retreat of the Western American Diocese is scheduled from Monday the 17 to Wednesday the 19 of March, 2014, at the Old Holy Virgin Cathedral located at 864 Fulton Street in San Francisco. 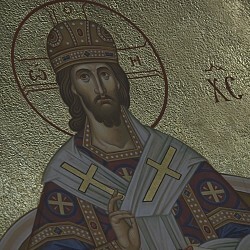 The annual Lenten Retreat that has been held at Holy Virgin Cathedral over the past several years cannot be organized this year due to the pressures of planning for the large-scale forthcoming events of the 20th Anniversary celebrations of St John, the Sobor of Bishops of the Russian Orthodox Church Outside of Russia and the XIII All-Diaspora Youth Conference. A concert-choral recital of sacred music by the parish choir of the Church of All Russian Saints will take place at 744 El Camino Real, Burlingame, on Sunday, March 16, at 1 PM. The program will feature works that will be sung at our services during Great Lent and Passion Week. Admission is free; seating will be limited, on a first -come basis. At the latest Saint Herman’s West Youth Conference held on the 22 to the 26 of December, 2013, at the Russian New Martyrs Church in Mulino, OR, Archimandrite Irenei (Steenberg) and Matushka Natalie Henderson gave a presentation on "The Role of Women in the Church." The XIII All-Diaspora Youth Conference of the Russian Orthodox Church Outside of Russia is being organized under the theme: "In the Footsteps of St. John." This conference will be dedicated to missionary work on the basis of social services and volunteer charity work and will be taking place during the All-Bishops Council and the Feast Day of Saint John of Shanghai and San Francisco the Wonderworker as this year marks the 20th anniversary of his Canonization. On March 9, 2014, the First Sunday of Great Lent, the "Triumph of Orthodoxy with the Anathema Service" was performed in the New Cathedral of the Most Holy Theotokos "Joy of All Who Sorrow." Having observed with grief and great concern the political upheavals in Ukraine, we ask that the faithful of the Russian Church Abroad strengthen their prayers for peace and the restoration of lawfulness among our brothers and sisters in that country. In this crucial time, when the Ukrainian people are searching for and trying to formulate a national identity, it is our fervent hope that they put at the head of the corner of this identity their Orthodox Faith, which has guided their fathers for over a thousand years. We, the faithful of the Russian Church Abroad living in America, regardless of our ethnic identity are all deeply connected to Kiev through our Enlightener, the Great Prince Vladimir. His decision to baptize the Kievan people led to the establishment of Holy Rus', which cultivated a great multitude of ascetics and saints, including St Herman of Alaska, who followed in St Vladimir's footsteps when he brought the Light of Christ to North America. We request your heartfelt prayers for the health and recovery of Protodeacon Nicholas Triantafillidis, a pious and long-standing cleric of our diocesan cathedral. He has been visited by a dire illness. Please, support Father Nicholas by your prayerful petitions during this hour of trial for him and his family. In relation to the political events that are now transpiring in the Ukraine, and with the blessing of His Eminence Archbishop Kyrill, on Sunday the 23 of February at 5 pm a moleben "For the Increase of Love" will be served at Holy Virgin Cathedral. Following the molebien a "Litya for the Departed" will be served. His Eminence Archbishop Kyrill of San Francisco and Western America requests that the following Patriarchal Address be read in all of the monasteries and parishes of our diocese on Sunday February 23 of this year. During the weekend of February 8-9, the Hawaiian Myrrh-Streaming Iveron Icon visited Southern California, brought by her guardian, Reader Nektary Yangston. Holy Transfiguration Cathedral of Los Angeles regularly holds Divine Liturgies on Saturdays, and on Saturday February 8th, a special blessing was imparted with the presence of the icon. The Rector, Archpriest Alexander Lebedeff presided, co-served by Cathedral clerics Priest Roman Katyshev, and Protodeacon Andre Karobkoff. Just over a year ago a new journal appeared – "Spiritual Spring" – an official medium of the Western American Diocese. The Sts. Cyril & Athanasius Institute is offering its third set of Symposia this month, in two different California locations: in San Francisco on the 15th and 16th, and in the Los Angeles area (Riverside) on the 22nd and the 23rd. The theme of each is the same - "Martyrdom in the Christian Life: Yesterday, Today, and Tomorrow". His Eminence Archbishop Kyrill visited the Deanery of Mexico from January 17 to 20 of this year. On Friday January 17th His Eminence Archbishop Kyrill arrived in Mexico City where he was greeted by clergy of the Deanery of Mexico, as well as by the church warden of the local parish His Excellency Prince Alexander Saitcevsky, who hosted a dinner in honor of His Eminence. The first video offers an overview of the conferenceand the second has the lecture read by Archimandrite Irenei (Steenberg) "Prayer in Our Daily Life." The VII Annual Saint Herman's West Youth Conference was organized by the Western American Diocese Youth Department from December 22 to 26, 2013, under the direction of Archpriest Boris Henderson, Rector of All Saints of Russia Orthodox Church in Denver, CO. Father Boris has many years of experience working with youth and in organizing this event. He himself was a participant in the Saint Herman Youth Conferences as a young man and then as a priest for many years assisted in such conferences on the East Coast. With the blessing of His Eminence Archbishop KYRILL of San Francisco and Western America we announce the re-opening of the diocesan website.